After my Professional Practices class I sat down in the illustration office and painted this out once I had found my tablet stylus. 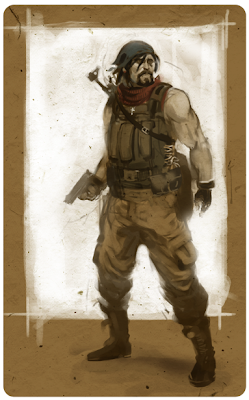 I just wanted to do something spontaneous, so I asked my friend Alex Lyon for a type of soldier, and he said "a merc". So here he is. Maybe an hour or so long speedie once I cut all the talk breaks out and stuff. Abe painting will be ready for scanning tommorrow hopefully, so expect that. Such speed! Such Beauty! Wonderful!